Ranchi Rays earned their first victory in front of an animated home crowd who turned up in large numbers to support their team and they were not disappointed. The hosts handed Kalinga Lancers their first defeat with a 7-2 win in a sensational match in the fifth edition of the Coal India Hockey India League played at the Astroturf Stadium here on Thursday. It was goals by Ashley Jackson (24’), Mohd Amir Khan (30’), Christopher Ruhr (31’), and Manpreet Singh (44’) who fetched Ranchi Rays five points. Having learnt from their earlier encounter against Kalinga Lancers that ended in a 4-2 defeat, Ranchi Rays refused to let the visitors control the ball in the first quarter, closing them down high up the pitch and constantly hunting in packs. When in possession, they were always in control, passing the ball around neatly and quickly to penetrate Kalinga Lancer’s circle. Though the home team made a few successful forays into the striking circle, the Kalinga Lancers’ defence was solid enough to keep them from taking an early lead, thus ending the first quarter in a stalemate. Ranchi Rays had their first PC of the game in the 17th minute, Trent Mitton stepped up to the drag flick. His attempt was good but not enough to put it past Kalinga Lancers’ goalkeeper Andrew Charter who continued to impress with an incredible save. Another chance at scoring a penalty corner came in the 24th minute, and this time, Manpreet Singh was spot on with the injection while the experienced Ashley Jackson made no mistake in converting the goal and giving the home team a much needed 1-0 lead. Kalinga Lancers earned their first PC of the game in the 26th minute but Gurjinder Singh’s drag flick was brilliantly padded away by Tyler Lovell and ensured Ranchi Rays held on to the lead. In the 30th minute, Ranchi Rays took their lead to a strong 3-0 when Junior World Cup winner Sumit, from within the circle, perfectly passed the ball to Mohd Amir Khan for a deflection which sent the ball into the post. 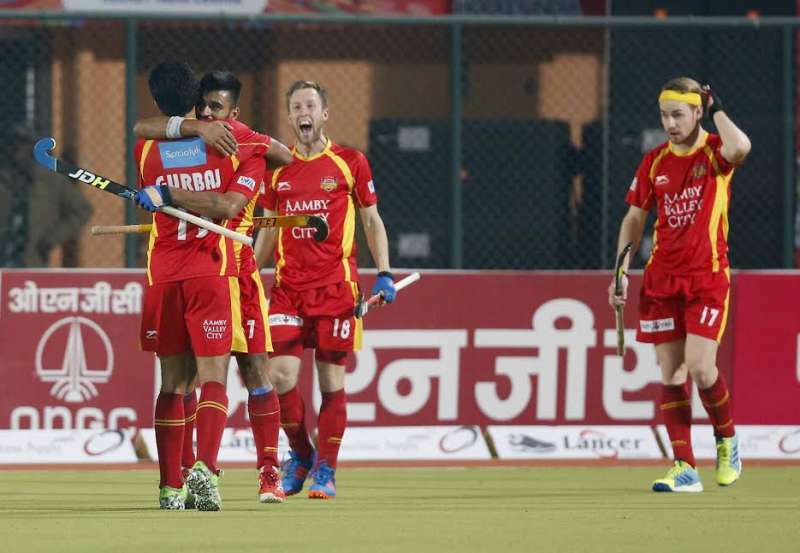 Rampant Ranchi Rays continued their dominant form into the third quarter. This time Ashley Jackson took charge, seeking possession of the ball, and acting as the lynchpin in the midfield. Racing into the Kalinga Lancers’ circle, it was Jackson’s pass to forward Christopher Ruhr, a minute into the third quarter, that won Ranchi Rays their third goal taking their score to a comfortable 5-0. This was also the 25th goal of the Coal India Hockey India League 2017. Another goal came in the 44th minute when Gurbaj Singh intercepted Kalinga Lancers’ pass in the midfield and raced away towards their circle and passed to Manpreet Singh who made no mistake in finding the gap. The score read 7-0 before going into the final quarter. In the final quarter, Kalinga Lancers started fast, desperate to find the goal that would give some respite. In the 49th minute, though Ranchi Rays's defence came undone when Lalit Upadhyay put a field goal past Lovell making the score 7-2. The action wasn’t over yet as Kalinga Lancers had their own opportunities at the close, but Ranchi Rays's defence stood their ground denying them off anymore goals running down the clock, to give them their first victory in the League. Ranchi Rays Christopher Ruhr was awarded with a prize money of Rs 50,000 for scoring the Coal India Goal of the Match from Mr Gopal Singh, CMD, Central Coalfields Ltd.
Anand Lakra from Kalinga Lancers won the prize of Rs 25,000 for being the Hero Young Achiever of the Match from Olympian Mr Sylvanus Dung Dung. The Most Entertaining Player of the Match was awarded to Sarvanjit Singh of Ranchi Rays that came with a prize money of Rs 25,000 by Shrimati Raj Bala Verma, Hon'ble Chief Secretary of Jharkhand. Ranchi Rays Ashley Jackson was declared the Man of the Match and was awarded a prize money of Rs 50,000 by NK Pal, Assistant Director SICCL. On 27 January 2017, Dabang Mumbai will take on Jaypee Punjab Warriors at the Mahindra Hockey Stadium in Mumbai.